Happy 2014, long lost readers! I do apologize for allowing to happen to my website what traditionally happens to websites for people involved in academia over the end of the year and holidays. I won’t let it happen for at least eleven more months. This semester and year will be bringing a handful of great conferences (including the UTK Geography Research Symposium in February, the AAG in Tampa in April, and a few others I’ll be announcing as they’re confirmed) and projects, so get excited. Before I tackle any of that, though, I need to venture into the world of cult video on this week’s “episode” of Sonic Geography. “new technology actually encourages and facilitates the study of the past… in the centuries after the printing press was invented, recently rediscovered plays from the ancient world began to be disseminated throughout Europe, helping to spark an explosion of theater in the Renaissance. Similarly, by the 1980s, video- and audiotape technology, combined with the multifarious choices offered by cable television, combined to expose a generation of young people to a flood of “new” entertainment from the first half of the twentieth century” (p. 291). So, of course, we should not be surprised whenever contemporary internet instant-archivist technology aids and abets the renaissance of certain cultural traces stamped by that aforementioned video- and audiotape technology. One of my personal favorite examples of this has been the reconceptualization and rise of Jeff Krulik and John Heyn’s completely unwitting 1986 verité masterpiece Heavy Metal Parking Lot over the past decade. HMPL has become something of a starting point in the conversation of “found video,” despite never truly being lost as it was disregarded for over a decade. By the early 90s, multi-generation VHS dubs of HMPL had made it into the hands of various cultural taste-makers, including, notoriously, Kurt Cobain. The internet made it possible for millions more regrettable-culture-fixated consumers to see the documentary. For those of you who are uninitiated, the film is accessible online and only 17 minutes long, so if you haven’t seen it yet, I would recommend going to watch it right now, then come back here to continue reading. Now, wasn’t that ridiculous? People once dressed like that and acted like that. In front of cameras. HMPL has grown into its role as prototypical evidence that open-access, streaming video has directly impacted human behavior nearly world-wide. In 1986, if a pair of unaffiliated nerds walked up to a drunk/high you with a video camera, your instinct would likely be to perform rather than worry that your parents, boss, or millions of people would ever see this video one day. The geography of media access and approach has changed more in these past fifteen years than it had in the prior 100, and it has changed more in the past century than it had in the previous 10,000 years. At any rate, the drunken metal fans immortalized on that day in Landover, MD had little reason to suspect they would ever be…immortalized… as anything, especially not an image embedded to the right of this paragraph. Admittedly, I never saw this until a few years ago, well into my life in Washington, D.C. Fortunately, certain connections allowed me to strike up a friendship with one half of the tandem responsible for HMPL’s existence, Jeff Krulik. I always ran into him at cultural events around the DC Metro, and he always had some great news about his past and current projects popping up in places he never expected. As you’ll read from him below, the biggest surprise in his decades-long dynasty of public-access and all-purpose A/V dorkdom is that he’s still talking about these productions nearly thirty years after he and John Heyn decided to take some cameras and mics to the parking lot of a Judas Priest concert to see what would happen. In light of Jeff’s latest locally focused rockumentary Led Zeppelin Played Here, I decided to drop him a line to say hello and ask him a few questions. The topic of media geographies came up often in my seminar on Public Memory, so I thought I would get some insight directly from the man whose ascent to cult icon status has been anything but linear. First and foremost, WHY was there such a mystery whether or not Led Zeppelin, one of the most celebrated and popular bands in rock history, played the Wheaton, MD show in 1969? Were accounts that contradictory and was there no photo/video evidence? And why not (if not)? Led Zeppelin had just landed in the states not even a month earlier. Their first US concert was December 26 in Denver. They then just crisscrossed the country—some gigs were set up in advance, some in haste. 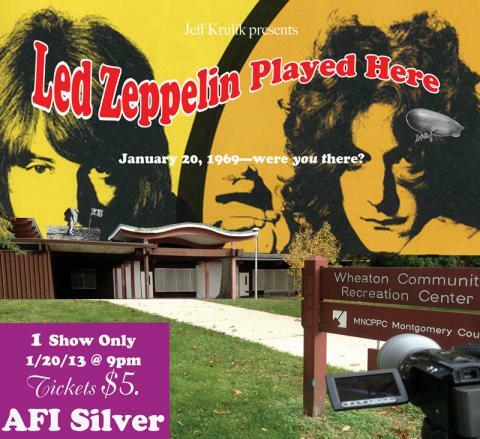 Weeks earlier on this first tour–which concluded mid-February 1969–was the apocryphal January 20 concert at the Wheaton Youth Center outside of Washington, DC, but there is no documentation to verify that show, and the promoter only says there were 50 people watching Led Zeppelin perform in the youth center gymnasium. It’s hard for people today to get their head wrapped around this notion, of a failed Led Zeppelin concert in a small, modest location, without any documentation to back it up—no posters, advertisements, reviews, ticket stubs, etc. All we have are eyewitness testimony, or the many doubting skeptics, to tell this tale, and I’ve gathered a lot of this storytelling in a nearly 90-minute feature length documentary. January 20 was the Wheaton Youth Center concert in suburban Maryland. Right now, the official Led Zeppelin website has the date listed as ‘rumoured.’ That same day also happened to be the Presidential Inauguration of Richard Nixon. It was only Led Zeppelin’s 26th day in the United States, and the first album had only been released eight days earlier on January 12. So nobody really knew who they were, and there are many factors that contribute to this event being a tantalizing mystery, almost a ghost concert, and that’s why I like it. Do you think this Led Zeppelin-mystery could have originated from anywhere but the Washington DC area? What was it about DC that created this legend? I think this Led Zeppelin-mystery could indeed be from anywhere, and indeed there are a few other unconfirmed concert dates on that first tour, but I think what helps with my story is Richard Nixon and inaugural events, although it’s not really germane to the story, just a tasty happenstance. My goal for the documentary was to really be about the emergence of the rock concert industry, focusing on the mid-Atlantic and MD/DC/VA area specifically, and I think that’s largely been achieved by the response from our screenings. The concert industry was basically being invented at that time, and everything that we now take for granted—ticketing, promotion, security, safety, large venues, booking agents—had very humble origins. And what was happening at the Wheaton Youth Center was in many instances being replicated all over the country. I know I may have asked you similar questions on the podcast, but how has the internet-shrunken world affected the way you approach film-making today rather than back in the day? I honestly haven’t changed my approach behind a camera when I’m shooting, or concocting what to film or how to film—but distributing my work is another matter entirely. Internet online video has revolutionized all facets of bringing eyeballs to your work. When I was starting out, you couldn’t even project video in theaters (which is why Heavy Metal Parking Lot developed such a life by VHS tape trading), much less blast it out in moments to a potential global universe. Unfortunately, everyone else is doing the same thing, so to say there’s a glut of content out there is a huge understatement. But honestly, it took a lot of work back then, and it takes a lot of work now. And it was always competitive trying to generate an audience. And as much as film festivals, and especially the big name ones, carry great cachet, it’s incredibly difficult to secure a slot. So getting notice can come from other ways, most notably the internet. But often times the shelf life can be cruelly short, as another video, or hundreds more, are immediately ready to garner attention. What’s the most surprising thing about the Heavy Metal Parking lot bootleg diaspora/dissemination (so to speak) that made it back to you? Location? Person (Nirvana notwithstanding)? 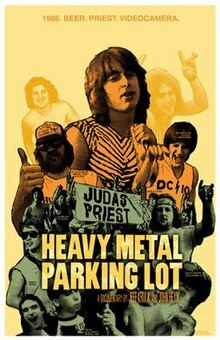 I think the most surprising thing about Heavy Metal Parking Lot is that I’m still talking about it almost thirty years later. But that’s a good thing. No complaints, just a nice surprise. John Heyn and I will always be grateful for the ride, and hope it will continue indefinitely. I’m also always thrilled to hear from our ever expanding on-screen alumni, the Heavy Metal Parking Lot family. I dream of having a bona-fide reunion one day, and film it, but until then you have to settle for stuff like this and this. Do you think Public Access had a heyday in the 1980s or any time else? To be honest, I can still flip cable channels and stop dead in my tracks on a public access channel and watch, often bemused, or at least curious enough to try and Google some background particulars. But I think the only reason you could consider it something akin to a heyday is because there were few other options to watch really far out, weird, and eccentric content on television. Nowadays, it’s everywhere on your computer, and conventional TV watching as we knew it has been turned on its head. I will say that the public access community television from my perspective is still happening and viable, and if people want an outlet to expressive themselves, I can think of no better way. For more information on Jeff, consult his IMDB or follow him on Twitter. I interviewed Jeff in 2010 for a podcast I was working on at the time called The Big Takeover Radio Show (no relation to the magazine), but I’m having difficulty finding that recording on my old hard drive. If anybody reading this may still have their digital hands on a copy of Season 5, Episode 15 of that and could email me at sonicgeography (at) gmail, I would be forever grateful. My radio archives have been down for over a year now since I blew up my old website, but they still exist and are available upon request. 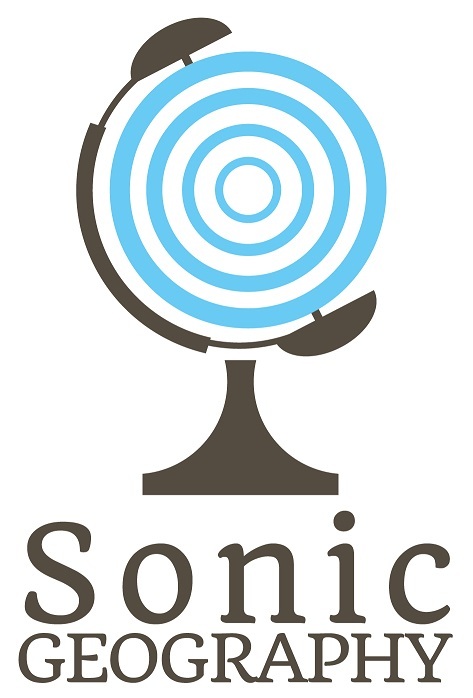 Hopefully more will be uploaded and made available via the iTunes store or just directly from SonicGeography. And if anybody has access to the 1997 Krulik gem Ernest Borgnine on the Bus, please do share. Stewart, D. (2005). No Applause – Just Throw Money, or The Book that Made Vaudeville Famous. New York: Faber and Faber, Inc.